Plato, the old owl of Penny Wood, finds a young crow weeping over the bodies of his parents the hunters have killed. 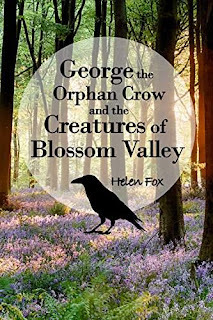 He comforts the orphaned crow and promises to send him to a place where he will find a new home and make new friends.When Plato learns the crow doesn't have a name, he names him George. As George's journey begins, a whole world of imagination is opened as he explores and discovers the fairy-like surroundings of his new home in Blossom Valley. Past the Ant Village, the Schools and the Hospital and there lies a whole community of all kinds of creatures, There's Thelma, the spider, head of the community, Bond , the red squirrel and his crew, who guard the Valley, Conti, the tenor frog, Mr B. Rabbit, a tap-dancing champion. Speedo, the storyteller snail and the enchanting dream-like butterflies, among others who complete the family. An unforgettable story of a creatures'world with human-like lives and emotions, as in our own world, only magically different.